After a five-year hiatus, the Canada Cup competition resumed in 1981 with Canada, the United States, Sweden, Finland, Czechoslovakia and the Soviet Union once again vying for international hockey supremacy. A total of 60 NHL players (22 Canadians, 22 Americans, 12 Swedes and four Finns) participated for their homelands. As in 1976, the Soviet Union was in a rebuilding mode (after their Olympic loss to the United States in 1980). Only eight players remained from their 1976 Canada Cup squad, and just 11 players were back from the team that had defeated a group of NHL All-Stars at the Challenge Cup in 1979. Among the talented crop of Soviet newcomers were 21-year-olds Alexei Kasatonov, Igor Larionov and Vladimir Krutov. Viacheslav Fetisov made his Canada Cup debut, while veteran Vladislav Tretiak once again tended goal. Meanwhile, Team Canada had a young phenom of its own in Wayne Gretzky, who had set an NHL scoring record with 164 points in 1980-81. Gretzky headed up a Canadian roster that also featured Mike Bossy, Bryan Trottier, Clark Gillies and Denis Potvin of the two-time, defending Stanley Cup champion New York Islanders. Goaltending duties were handled by Mike Liut. Canada waltzed through the round-robin portion of the tournament with only a 4-4 tie against Czechoslovakia blemishing a record that included a 7-3 victory over the Soviets in the final game on September 9. Despite the loss, the USSR held down second place with a record of 3-1-1. The Canada Cup format had been expanded to include a semifinals round this year, and Canada defeated the fourth-place United States 4-1 while the Soviets bounced the Czechs by the same score. 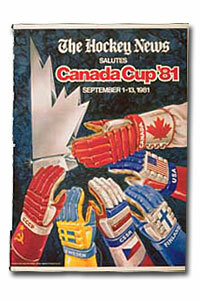 The one-game 1981 Canada Cup finals took place in Montreal on September 13 and saw the Soviet Union destroy Team Canada by a final score of 8-1. 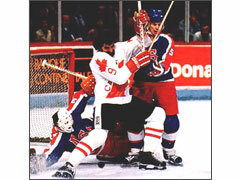 The Soviets frustrated Wayne Gretzky throughout and kept the tournament's leading scorer (12 points on five goals and seven assists) off the scoresheet, while Sergei Shepelev beat Mike Liut three times and Igor Larionov added two goals. Despite their victory, the Soviet team was not permitted to take home the Canada Cup trophy in a decision by Alan Eagleson that nearly sparked an international incident. Vladislav Tretiak was named the Most Valuable Player of the Canada Cup tournament after the Soviets allowed just 15 goals in seven games. Behind Wayne Gretzky on the scoring list were Mike Bossy, Bryan Trottier, Guy Lafleur and Alexei Kasatonov, who all had 11 points. Bossy's eight goals topped the tournament, as did Kasatonov's 10 assists.